Much has been questioned about the relationship between giraffes and okapis and why of their distinct anatomical differences when both belong to the same family, especially those related to neck size and coat color. A recent research done in 2016 revealed that the common ancestor between giraffes and okapis lived about 11.5 million years ago. 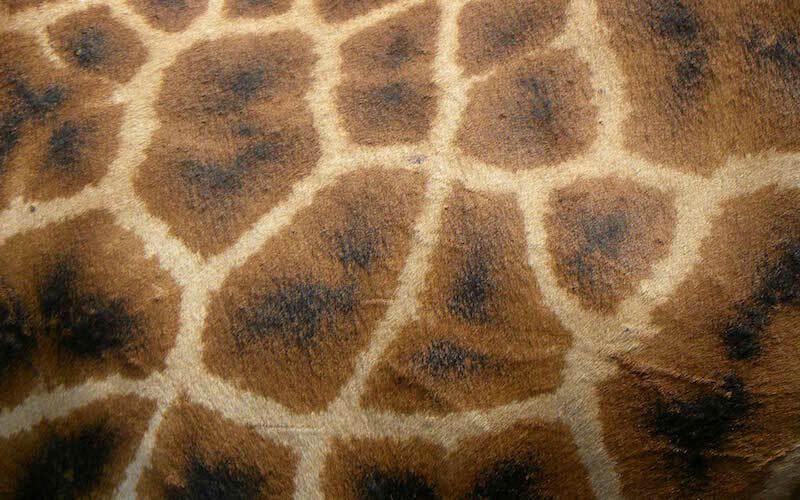 Giraffes are also related to the Cervidae family regarding their skin. Also, the members of the family Antilocapridae (of which the pronghorn currently survive) are said to be closely related to the Giraffoidea superfamily. Animals that we see so different today had an evolutionary past fascinating more related to each other than we believe. Since Carl Linnaeus first classified giraffes in 1758 under a single species, other authors joined the task of research to find differences between members of the genus Giraffa. From then to date, its taxonomy has been modified several times when reclassifying species and subspecies. The taxonomy of the giraffes has been a bit changing over time. First, a single species with eleven subspecies was recognized, although the scientific community only accepted nine subspecies eventually. However, research on these mammals continued for over a century, and there are still doubts about the distinction of each species and its genetic variation across its range of distribution. In 2016, a group of scientists took DNA samples of wild populations of all types of giraffes and for the first time, the subspecies Giraffa camelopardalis camelopardalis, better known as Nubian giraffe, was included in the genetic analysis. The results identified four separate and monophyletic species, meaning that all individuals evolved from a common ancestral species. Therefore, under this criterion of genetic isolation, four distinct species of giraffes should be recognized. Such modifications and new discoveries show the genetic complexity that this fauna involves, sometimes overlooked by the research on its conservation efforts, which has become a central and urgent theme in to fight the many threats that giraffes face all over the African continent. In short, modern scientists considered for many years, all the giraffes as a unique species called Giraffa camelopardalis. But this has become a topic of debate because researchers from three countries published the results obtained from DNA analysis, where the whole previous panorama was modified, arriving at a very different conclusion from what is already known by all. The other two species do not have subspecies. Genetic analysis is being used more and more to understand the populations and the evolution of the species. When different populations reproduce between them, a genetic flow occurs that helps to maintain similar genetic code, and therefore, is enough to continue the same species. However, when these different populations do not breed for long periods of time, they become genetically isolated and may diverge into new species with distinctive characteristics that come to light, forcing a resetting of the Taxonomic order. This analysis also explained that the genetic evidence of giraffes suggests that the divergence of the four species occurred more than one million years ago, at a time when populations separated. After this, some scientists say that the species and subspecies should be treated differently and for reasons of biodiversity they should not be mixed or considered as part of a unique species only because they are anatomically similar. Some species have more ossicones, different colors, shapes of spots, and even different heights than others. New results on giraffes continue emerging, which means that this recent analysis will not always be entirely definitive. The classification on this fauna will continue, and most likely, the documentation and scientific books must always be updated. This issue is paramount regarding conservation because considering giraffes as a single species, they would not be in a critical conservation status, but considering four species, the perspective changes radically, since some populations may be at significant risk of disappearing or could be undergoing a silent extinction. A population of 100,000 giraffes is estimated throughout Africa, representing a 40% decrease in the wild. While genetic research has changed the taxonomy perspective completely, there are still many unanswered questions. There is a debate about how intelligent giraffes are. While you can’t train giraffes to do tricks or other things they seem to have a good sense of information that goes well beyond their instinct. However, some argue that these animals don’t know much except how to eat and how to survive. More research has to be done to prove these theories. One particular element of giraffe research that needs a great deal more of information is their communication as they don’t make many vocalized sounds. While researchers have recognized the meanings behind many of their sounds, there are other that have to be understood, and if proved it indicates a higher level of intelligence than most thought. One study in Africa brought to light some interesting information about giraffes. From time to time large numbers of them die off, and that is a concern. Now there is evidence that it is a parasite that is in the water they drink, which cause them to become sick and die.